Cataract Canyon and Canyonlands National Park comprise an area of unique beauty. It is a land of rock, spires, arches, buttes, mesas, and pinnacles. Every season in Canyonlands is different and every day brings new offerings. 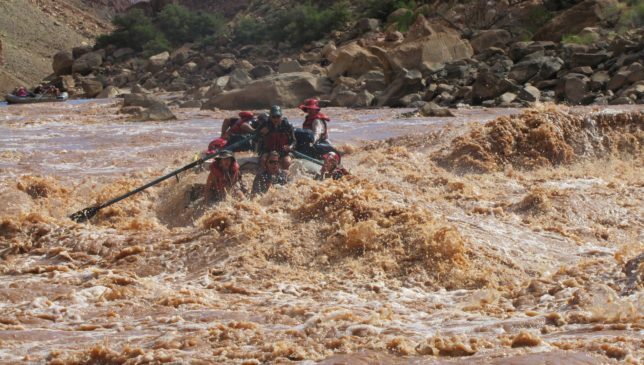 Below is a list of 10 things one might experience on a Cataract Canyon rafting trip. There are thousands more. The vastness of the the landscape and different characteristics of the Green and Colorado river in their own canyon make each river experience unique. 2017 is stacking up to be a great year. The snowpack in the Rockies and the Wind River Mountains is well above average. As this snow melts the Green and Colorado River will rise. When this happens the water will rise in Cataract Canyon and some of the biggest rapids in North America will present themselves. These high flows usually occur sometime between mid-May and late June. As the water starts to recede in July beautiful sandy beaches and sandbars will start to appear. The rapids will mellow out some and our larger motorized rafts will be exchanged for smaller oar rafts. The Big Drops are composed of 3 separate rapids. Big Drop 1 is the warm-up to Big Drop 2 aka “Little Niagara” and Big Drop 3 aka “Satan’s Gut.” At flows above 40,000 cfs these rapids are bigger than Lava Falls and Hermit in the Grand Canyon. 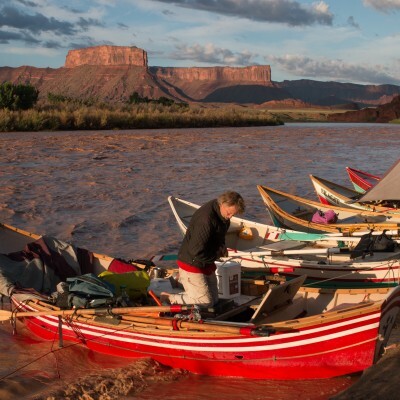 Colorado River and Trail Expeditions Boatman Lukas Gabert in Big Drop 2. 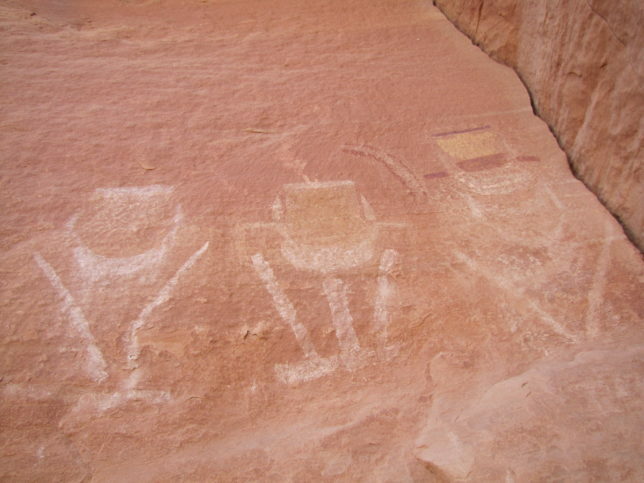 JW Powell, Stanton, Eddy, Best, and many more are found throughout Canyonlands National Park. 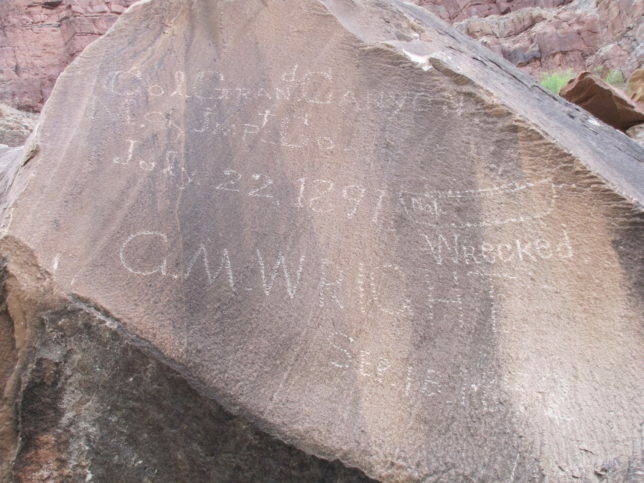 Inscriptions are abundant at Capsize Rapid where early river runners spent time trying to free lost boats. 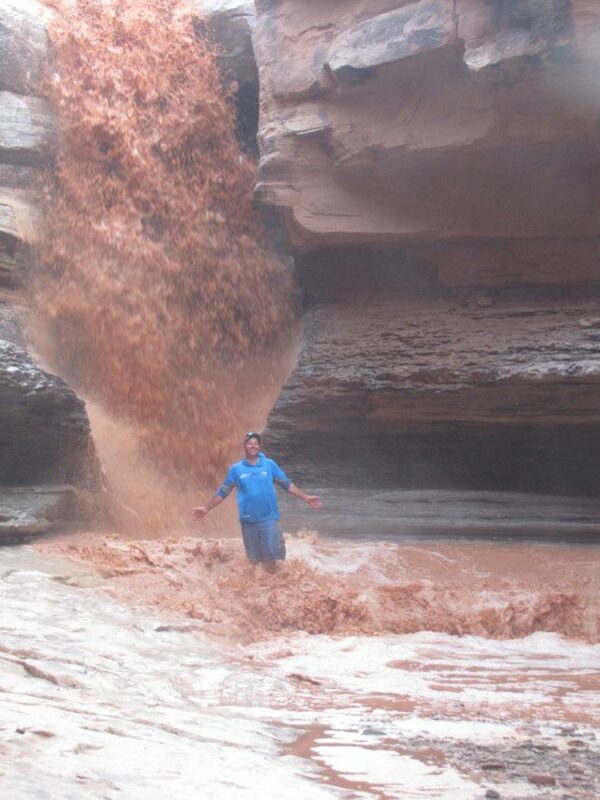 During the spring run-off and after a large Thunderstorm you might get to see Indian Creek flowing with all its power. Canyonlands is rich in human history. Ancestral pueblos lived throughout the canyons and flourished in the landscape. Pictographs left behind by people long ago. 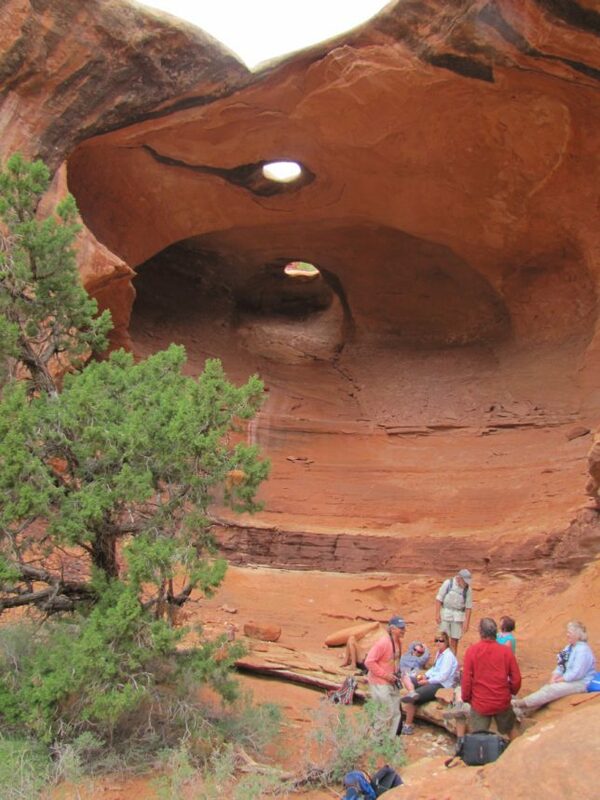 There are arches, windows, and natural bridges scattered throughout Canyonlands National Park. Starlight Arch is found in the “Island in the Sky” district of Canyonlands National Park and is a common hike on our Spring and Fall trips on the Green River. One of the many spectacular sites in Canyonlands National Park. The Green and Colorado River offer great opportunities for viewing 1000 year old ruins. 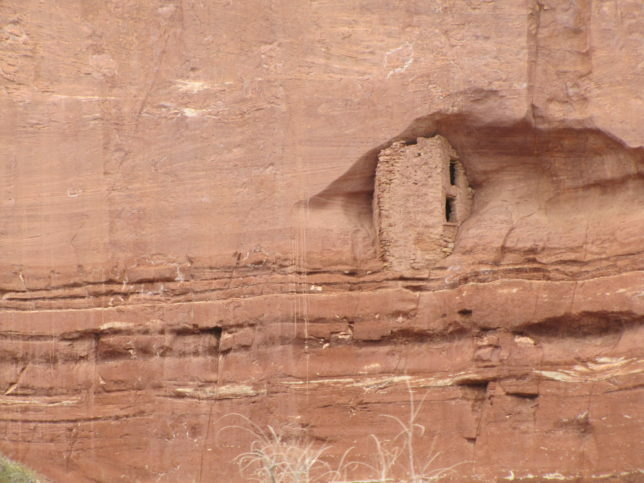 An ancestral puebloan dwelling seen along the Green River near Anderson Bottom. One of the best parts of doing a Spring rafting trip in Canyonlands is seeing all of the Wildflowers. 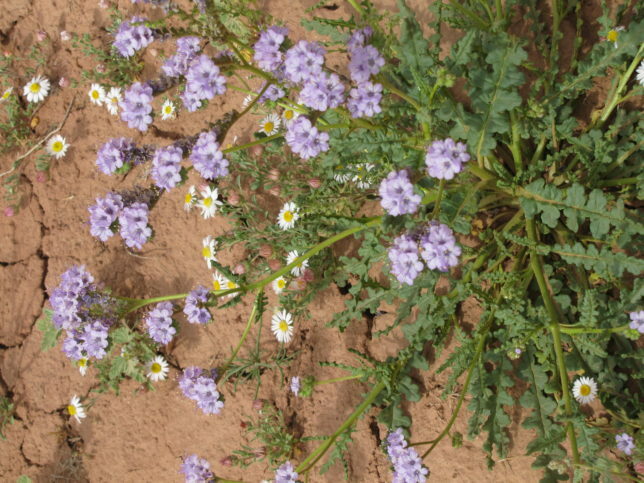 Wildflowers are abundant in the Spring along the river and off of hiking trails. 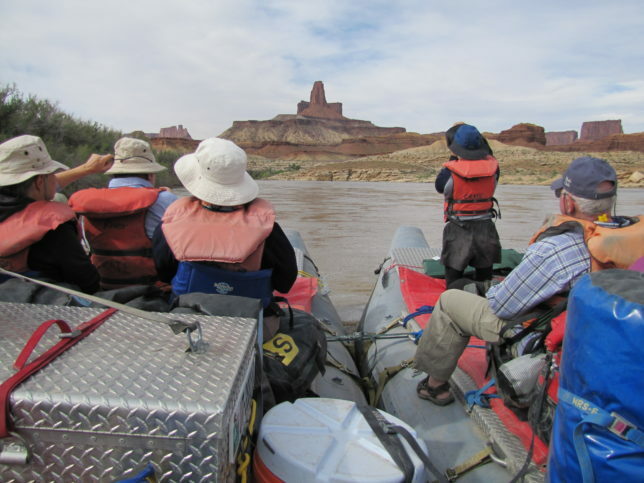 The Buttes of the Cross can be seen on the Green River before joining the Colorado River and entering Cataract Canyon. The Doll House is in the Maze district of Canyonlands National Park and can be accessed from Brown Betty, Spanish Bottom, or Rapid 5. One of the best things a river trip does is reconnect you to nature. It gives a chance to put away clocks and get into the natural rhythm of life. Watch sunrises, sunsets, and sleep with a blanket of stars. 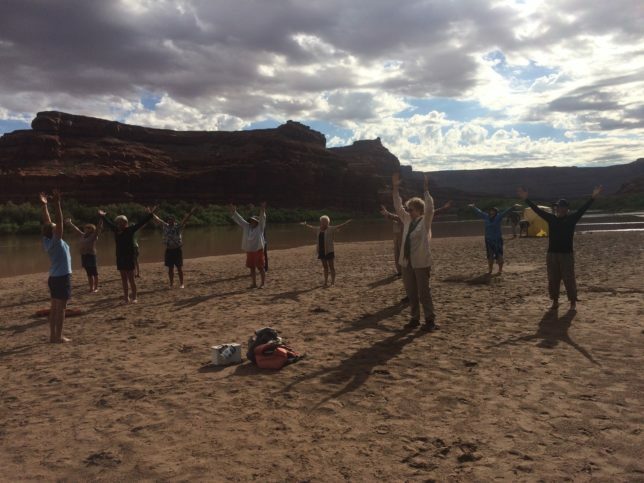 Boaters enjoy a morning session of Beach Yoga. Posted February 9, 2017 by Crate Inc.